Admission for all panels is free. 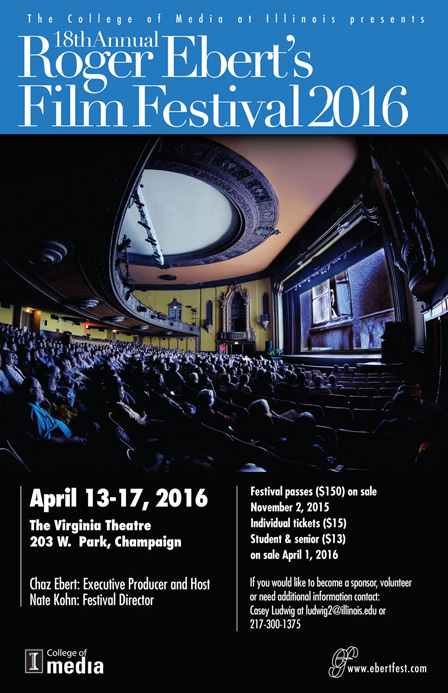 The screenings of Roger Ebert’s Film Festival will take place at the Virginia Theatre, 203 W. Park Ave., Champaign, IL, beginning tomorrow, Wednesday, April 13. The official “Ebertfest” Web site features the complete film schedule, individual reviews, and details of other related events. Festival passes and tickets for the majority of individual shows are possibly still available, while you can stand in a “rush line” prior to each show in case seating is available. This entry was posted on Tuesday, April 12th, 2016 at 9:00 am	and is filed under Area Festivals, Education/Classes, Public Events, Roger Ebert. You can follow any responses to this entry through the RSS 2.0 feed. Both comments and pings are currently closed.